Portugal has so many traditions and ways of doing things. Check this out! 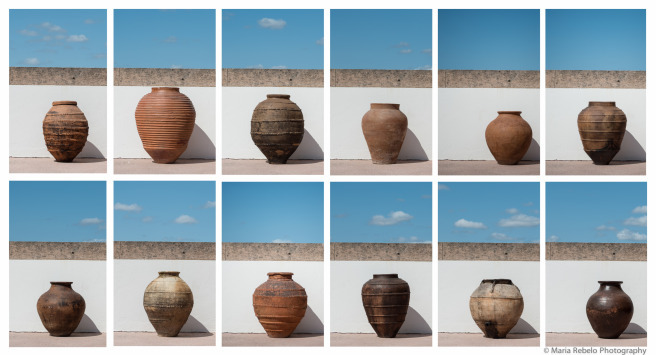 The Flor da Rosa Pousada in Crato has a beautiful collection of “talhas” (clay amphoras) made by potters in Alentejo. The small amphoras were used to store olives or olive oil. The large ones were used to produce wine, a tradition that goes back to Roman times. Several Portuguese wine makers are rediscovering the lost art of producing wine in amphoras. One of them is Dirk Niepoort, a great producer from the Douro region. We can’t wait to try these wines which bring the past into the future! Click here for the Pousadas’ website and here for more photos of Flor da Rosa. Had? Aren’t you still youthful. Whew! I thought I might have to age if you did. Goodness, no! That would never do! I would keep a collection of those pottery things in my house, I’m thinking. Such a beautiful way of life. in order to be able to make a semi-intelligent comment, or as close to that as I my feeble IQ is able to muster, I googled up Portuguese Wines. Wow. I sat here for 45 minutes reading about the various quality wines and a history that predates France’s by 200 years. Way cool. So interesting! The way there is so vastly different from here! They are most famous for Port Wine. Hi, Susan. I have been looking for you for years and just stumbled across your wonderful blog. Do you remember me? I used to be Kathy Shuster but now I’m Kathy Specht. I would love to be able to talk with you about old times and catch up on all the time we’ve missed. Oh! KATHY! I actually looked you up a long time ago and then life happened. I could never forget you. You, Gloria and Carolyn were my “besties” at Harding. (lost them. too).